Horidome from "Guide to Famous Spots of Edo Vol. 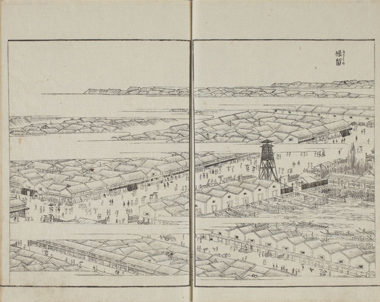 1"
The Horidome district was located in the vicinity of modern Nihonbashi Horidome-chō 1-chōme and 2-chōme; it being positioned along an excavated bund that faced onto and altered the flow of the two Horidome rivers (east and west). Water transportation was used extensively in the area during Edo times, with the town becoming well-known for its rice traders.